I get amazed that people don’t check into things like Terms of Service instead of making assumptions or taking the advice of others who probably don’t know either. Not share your password, give access to your Facebook account to others or transfer your account to anyone else (without our permission). The real problem, I believe, is that people misunderstand the use of the words ‘account’, ‘profile’ and ‘page’. When you open an account it must be in your own name and if you’re paying for any advertising you will need to be entering payment details with accurate information. Your profile is what you set up on your account, again, in your own name, and this can be set to private or public. I personally prefer to keep it private so that only those I ‘friend’ (i.e. my family and personal friends) can see what I post on my own wall, photos I share, posts I make, etc. A page is what you can create for your business, or hobby or personal interests, and I’ve even seen some for pets. You can have multiple pages but only one profile and one account. This is an assumption by many that people can see what’s on your wall, family photos and posts, etc if you create pages and other people like your pages, but that is not correct, if you have your settings set correctly. However, on your profile, your About section, cover page image and your profile image are all public. These can be seen, even if nothing else. So I do urge you to think very carefully about what you use for your profile image. And if you have a business page – don’t use the same image as your profile image, as it is very easy to make the mistake of posting to the wrong place in error. A simple way to work out what is a profile versus a page is this: On a profile people can be added as friends. You have to approve that connection. On a page anyone can like your page and you don’t have to be involved in approving this. In fact, you want it as these people are showing an interest in your page and are becoming followers. Profiles are NOT intended for business or commercial activities. Very important for you to understand this. In my examples below you’ll see there is actually quite a difference between a profile and a page. Pages have things that profiles don’t, to help you grow your business page, i.e. insights, publishing tools, promotions, etc, whereas a profile is about growing your friends, growing relationships, getting to know people through groups, and so on. Pages can’t join groups, only profiles can but it’s so important that the profile is about you – not your business. A profile must be in your own name, pages can be in business names or anything else you choose. Groups I moderate and am admin for, I tend to decline any applications that are in business names and not in personal names. Clearly they don’t know how to use Facebook properly. People want to know the person behind the business but that doesn’t mean you have to forsake your personal space and privacy to do that. Learn how to set your settings and get help if you need it. There is, however, something else to consider. 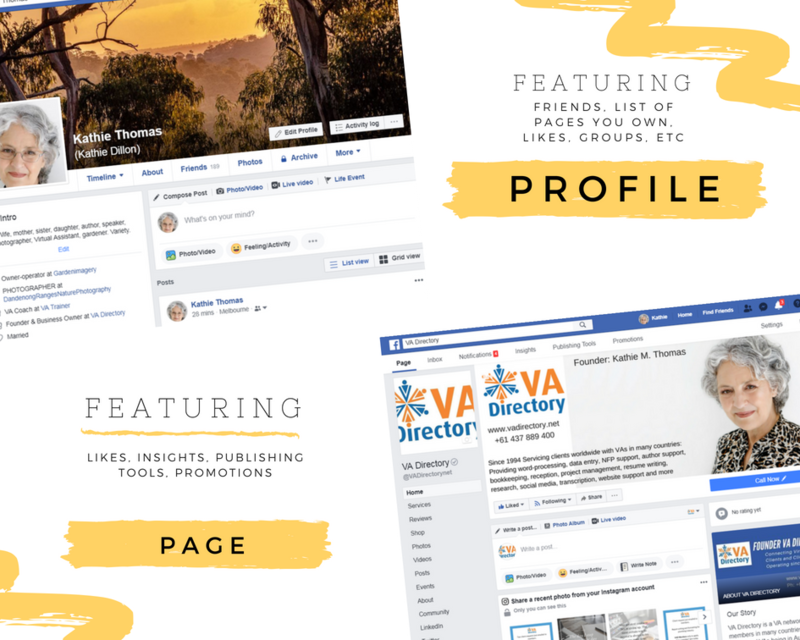 If you want only a page for business, but not a personal profile at all, you can get around this and have your profile converted to a page. Click here for information on that. I guess many want to join groups to network for their businesses and get to know others and they worry about the privacy of their profiles for those who might want to have a ‘sticky beak’ at the person behind the comments on groups. But you do WANT this to happen. How else are people going to learn about your business and interests, especially if you’re in groups where promotions are frowned upon and classed as spam? And let’s face it, many do abuse this opportunity, hence groups having to clamp down. BUT, if you fill out the About information on your profile and add links for your Facebook pages and website/s then people can find out more about you and follow your pages, join your groups and visit your website, perhaps even buy from you. Make Facebook work for you by doing Facebook the right way! That way, you don’t run the risk of having secondary, or both accounts shut down (and this does happen, believe me, as I know people who’ve had this done) and losing all your contacts, contributions and comments that you’ve built up over the years. Lastly, if you’re providing social media management, or are using the services of someone who provides this, who condones setting up a second account, probably best to consider someone else, or change how you’re doing things. Do it right and your business will grow over time, and your connections too. Happy Facebooking! P.S. I know that some want to become my friend on Facebook, or want to Follow me, but I have chosen to keep my Facebook profile private – for personal friends and family only. However, you can PM me, you can follow me at any of the pages you can see listed on my About profile or chat with me in any of the groups I belong to. Or visit one of my websites and send me an email or fill out the contact form. Discussions I saw recently revolved around how old the VA Industry is and how long the internet has been around. While the internet was ‘invented’ in 1983, it didn’t actually become available for world wide use till 1991 and the VA industry was birthed just 4-5 years later. And it was 1996 that I became aware of a new term for home-based secretaries, i.e. ‘virtual assistant’. You can read about the history of the VA industry here in Australia on my site. I had already been in business a couple of years by then. A long-time colleague of mine in the VA industry, Sharon Williams, has produced a histogram of our industry which is worth reading. A snapshot here in this post. The homesecretaries group that Sharon mentions is the same group I mention in my About page and the owner, Linda is the lady I made contact with early 1996 not long after getting online. If in doubt about the industry, it’s always worth checking the facts and who has been actively involved over the years. They are around – you just need to do the research. 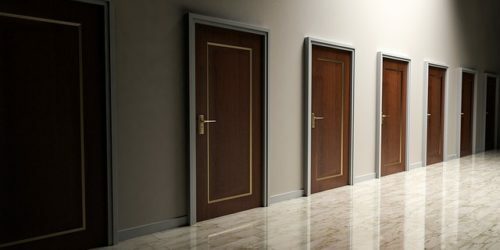 I recently read an article about the 5 challenges of a business hiring a VA. What it assumed was that when people are seeking offshore VAs, they want full time VAs from the Philippines. Not so, I’m in Australia, but if I’m working for a client in the UK, USA or another country, then I would be considered an offshore VA. And what was outlined in that article seems to really only relate to VAs in a particular region. VAs in the Philippines, and often other Asian countries, are mostly employed by agencies and, therefore, pretty much told what they can and can’t do and how they should operate. 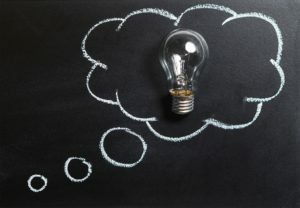 This article really gave false expectations of what business owners could expect when engaging all offshore VAs, rather than just a select group of VAs. No wonder the business world out there in general, is confused about our industry when even those involved in parts of the industry give out information that seems to make assumptions about the industry as a whole. Here is my answer to the person who shared that article – and I’ve had several other VAs respond and like my comment, confirming my response. Interesting the view of the VA industry above. 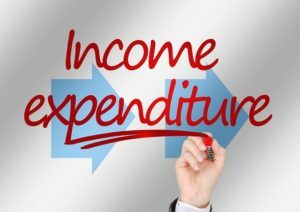 Here in Australia, VAs work for several clients, not one, otherwise they would be perceived as an employee by the tax office and then all sorts of ramifications ensue. Australian VAs and those in the UK, USA, Canada, NZ and many other western countries all operate in much the same way, setting their own rates, choosing the hours they wish to work and the type of work they do. The large majority do work in home offices and are focused on their work – not home distractions. And many VAs are in it for the long-term, not as a stop gap. As a consequence, while some may start out as a Jill or Jack of all trades, they eventually settle into niches. It is not uncommon for our clients to engage the services of 2, 3 or 4 VAs to fill different roles, much like you would have several staff in a corporation to fulfill several roles. For my own part, I’ve been a VA for 24 years and I have clients who have been with me for over 12 years. I also run a network of VAs, the longest term member registered with me in 1997 and is still an active member. As you would most likely conclude, from my comment above, the writer had indicated that VAs work 40 hours a week for one client, that it’s not generally liked that they work at home as they can’t be confirmed as putting in 40 hours (a trust factor here) and that it’s expected the VA can do everything, i.e. be a generalist. What is being described is very much a virtual employee, not a Virtual Assistant in the true sense of the phrase. VAs began as self-employed home based secretaries and it has grown from there, but at no point, ever, has the industry evolved into virtual employees. They are quite different. Just very frustrating when people insist on calling virtual employees, Virtual Assistants. No wonder people get confused. Recently I asked many VAs (hundreds) via some VA forums, what did they used to do before becoming a VA? And then a day or two later, I asked the same VAs, what do they do now. Amazingly, or perhaps not really that amazing, many were providing services that related to their past roles before becoming VAs. What does this mean to you, as a reader? Well, if you’re a potential VA, it means there is hope for you, as there is more than likely other VAs who used to do what you’re doing now. And if you’re a potential client of a VA, there’s hope for you, as it’s highly likely there are VAs who are experienced and equipped to carry out your business needs. Isn’t that great? Whatever your need – become a VA or engage a VA, I have the answers for you on this website. You just need to explore the menu items on this website. In the meantime, here is a list of what VAs used to do pre-VA and what they now do as VAs. EA, PA, event planner, pet care provider, nurse, project coordinator, geographic information systems analyst, optometric technician, retail manager, teacher, finance clerk, admin assistant, quality control in pharmaceuticals, sales attendant, medical assistant, chef, home care agency owner, copy editing, travel agent, property manager, zookeeper, musician, mortgage broker, school janitor, HR officer, para-legal, graphic designer, software developer, property valuer, family lawyer, systems analyst, big manager, swimming teacher, fire fighter. Secretariat for NFPs, social media support, ecommerce VA, operations management, web research, general admin VA, content strategy, content marketing, financial planning, social media management, WordPress specialist, blogs and newsletters, ebook creation, legal and minute taking, email management, communications, legal transcriptionist, medical transcriptionist, copywriting, SEO, online assistant support for Etsy shop owners, Pinterest VA, online stores, author support, data encoding, minute taking, sales funnels, web content producer. So, there you are, that’s just a small selection of the answers I got and they’re still coming through. 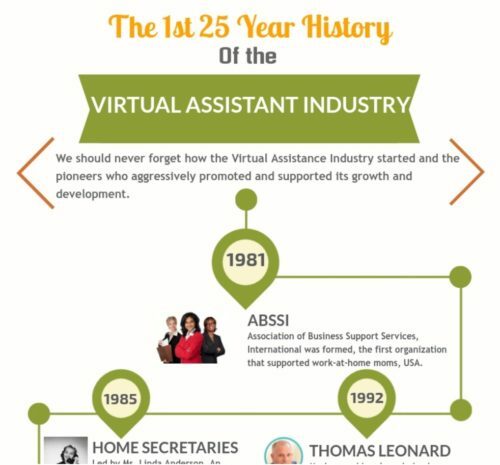 Hope this gives you an idea of just how wide and varied the Virtual Assistant industry is!